Affordable Accoutrements: Lenox and Magnolias! What makes a dinner party memorable? The menu of course; that goes without saying. A carefully crafted guest list can provide sparkling dialogue. Do you want the sweet, soothing sounds of companionable, sympatico spirits or the lively banter of good-natured, but wildly opposing, viewpoints? If you've visited Affordable Accoutrements before, you won't be surprised to learn that setting a visually appealing table is one of my top priorities. The table below is rather like a stage, carefully set and ready for the cast of characters to appear. It began a few hours ago. I gathered Southern Magnolia leaves from two different trees, sorted them according to size, made sure they looked presentable (some needed bathing in soapy water), plugged in my trusty glue gun, and went to work. My goal was to create leafy chargers similar to the ones I've seen in Southern Living (from a decade or so ago), on the Pottery Barn website (4 for $64), and in a picture from a Paula Deen table Susan of Between Naps on the Porch recently shared with her readers. I worked quickly, attaching the leaves to heavy duty paper dinner plates. I ran a line of glue along the rim of the plates and began pressing the leaves into place. The ones that didn't lie relatively flat were forced into submission with additional applications of glue. I was primarily concerned that the overall diameter be 16 inches. Since some of the leaves were larger than others, I glued a second, smaller plate on top to add stability. I used red ones I had on hand, since I knew that only the outer tips of the leaves would show. I took them outside to apply a light dusting of gold spray paint. I wanted the glossy dark green of the leaves to show through, with just enough gold to add a luminous quality. Single leaves in thrifted silver place card holders provide blank canvases for writing guests' names with a gold paint pen. What could be more fascinating than bringing together guests from different backgrounds and cultures? Today I'm thinking of friends who visit Affordable Accoutrements often and leave kind, thoughtful comments. People like the delightful Johanna from Germany. Her blog is Silber+Rosen. Charo from Lima, Peru, would be a welcome guest. Her blog is Atelier de Charo. The elegant Fabby from Ecuador. Her blog is Fabby's Living. Zondra from Croatia always shares gorgeous images on her blog, Zondra Art. Jackie from Surrey, UK, takes us along on fascinating tours of the historic places, castles, manor houses, and beautiful gardens she visits. Be sure to visit Jackie's Life in Surrey. And, finally, a place is set for Farah of Craft a World. Her post about the hidden beauties of her homeland, Pakistan, is an amazing visual treat. You can see it HERE. If this international guest list could result in blogging friends from far-flung places sitting down to dinner, I could never forget to invite my dear friend Coty, of Styling by Coty Farquhar. She and I have decided we WILL meet in person one day. Since Coty seems to have a sixth sense about such matters, I choose to believe. Have you had the feeling that via blogging we connect with people we've known in past lives? I'm not sure I believe that fully, but I definitely can't rule it out! I'd love to meet fascinating people like two of my favorite Canadians, Lori E. of Family Trees May Contain Nuts and Terri of Wind Lost. Lori jokes (I think) that it's really not too far for her to drive down for dinner. I think Terri will visit Tennessee soon, because her David is a US Civil War buff (and she thinks the antique shops here sound inviting!). Perhaps you want to know about the china and stemware. I had an e-mail recently from an area antiques dealer who, as it turns out, is a reader of Affordable Accoutrements. He wrote to notify me that he'd be directing an estate sale I might find interesting. I sensed that he somehow got the impression I have a dish addiction. While nothing could be further from the truth (OK, I heard that!) ... I did find myself at the sale looking at a pristine set of Lenox Hayworth china and crystal. In the e-mail, he mentioned that he'd make me a "sweetheart of a deal" on it if I took it all. By the time I arrived, he and his staff were packing unsold merchandise from the sale. As I protested that I didn't NEED any more dishes, he mentioned a price for the lot that was less than a single place setting of department store china. If you're reading this, Ken, thank you. I couldn't be more pleased with my purchase! The china was made from 1982 - 2010, and the crystal from 1982 - 1994. "Hayworth brings a fresh spirit to traditional design, combining Lenox hand craftsmanship, enduring quality, and value. The virtue of this gold-banded pattern is its simplicity... and simple elegance. The ivory fine china glows with the beautiful translucency that is the hallmark of Lenox." The description also says, "dishwasher safe," but I think I'll err on the side of caution and wash these pretty plates by hand. The Lenox candlesticks were an eBay find. A Lenox bowl ($6.99 at Goodwill) holds the centerpiece, recycled garden greenery from last week's tablescape, along with dried roses and zebra grass plumes (lightly sprayed with gold paint and previously used for December decorating). The flatware is Gorham's La Scala. I like using relatively ornate silverware with simple china patterns. I can appreciate the appeal of bolder, more colorful dishes, but a pattern like this really allows the food to be the main attraction. 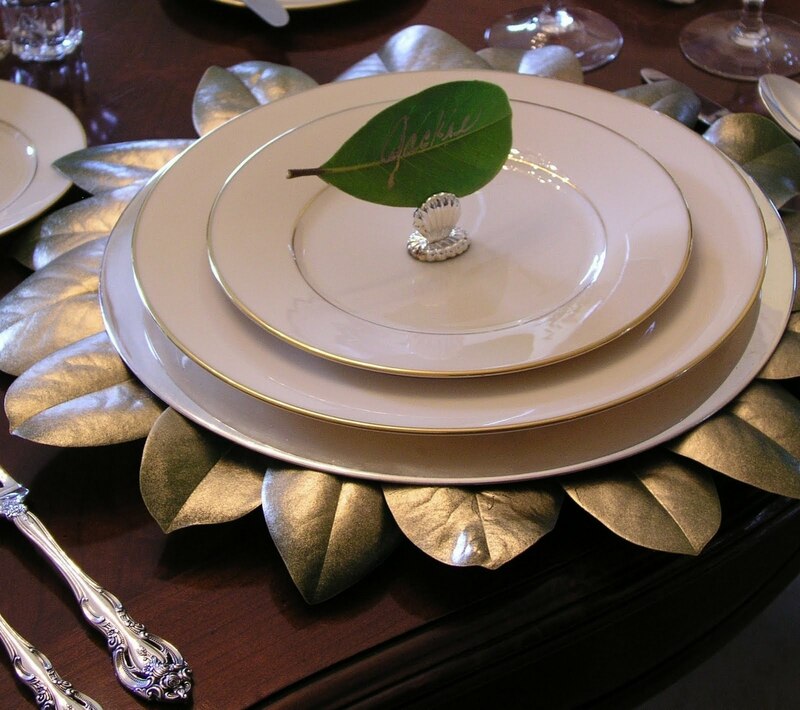 I used silverplated chargers between the leaves and the china to add contrast and interest. I could have glued the magnolia leaves to a flat circle of cardboard, but decided the paper plates would provide a visual lift, depth, and a place for the leaves to curl downward as they dry. I'm not sure how long these almost-free chargers will last -- probably at least a couple of weeks. The "napkins" are actually placemats -- perfect for spaghetti or spareribs! No? You're right -- I'll switch to dark red restaurant napkins when it's time for local guests to arrive. The napkin rings were included with the estate sale purchase. If you're a regular reader of Affordable Accoutrements, you've seen these dried roses before. They've served me well, and I can't bring myself to throw them away. You may have noticed that I've de-cluttered the table. I removed the cups and saucers (which I would bring back to the table when after dinner coffee is served). I placed the bread plates on top of the stack. They could be used as underplates for an appetizer or removed and brought back as dessert plates. Being a good host means always considering the comfort of guests. A crowded table is never conducive to relaxation and the full enjoyment of a leisurely meal. Candles definitely help set the mood. Soft music playing in the background adds further ambience. Scented candles provide a welcoming touch, but never on the table itself (where they can negatively impact the full enjoyment of dishes being served). The coffee pots are Haviland: Concorde (foreground) and Gotham. I think they harmonize nicely with the Lenox china on the table. While the china can photograph as being almost white on the table, this ginger jar juxtaposed with the Hayworth china shows how warm and creamy in color these Lenox dishes actually are. The stack of dishes in the foregroud represents extra pieces not used on today's table. With a bit of luck, eBay will provide a few more cups & saucers and a bread plate to make it a service for 9 (8 to use and one to lose). The colors overhead harmonize with today's table, don't they? As it turned out, the guests called with regrets, one after the other. It's now the morning after ... time to take a few more photographs. I hope you've enjoyed your visit. Before you go, I thought I'd share one of the menu items I'll be serving. Rules of Southern hospitality surely must dictate that a Magnolia-accented meal end with homemade pecan pie! While I can't lay claim to being an accomplished cook, I grew up surrounded by those who were. My father's sister published a cookbook filled with recipes she loved, lettered in her own hand, illustrated with drawings she'd done, and seasoned with stories of her childhood and her (my) family. I've tried a number of pie crust recipes, but hers is among the simplest and most reliable. Sift together flour and salt, cut in shortening with pastry blender or blending fork till pieces of fat are the size of small peas. Sprinkle water a T. at a time over part of mixture. Gently toss with fork. Push to one side of bowl. Sprinkle next T. of water over dry part. Mix lightly and push to moistened part at side. Repeat until all is mositened. Gather up with fingers; roll into ball. For double crust pie divide dough for lower and upper crust. Form each in ball lightly and roll 1/8" thick on lightly floured surface. If edges split, pinch together. Always roll from center out to edge. Use light strokes. Makes enough pastry for one 10" or 9" lattice top pie or one 8" or 9" double crust pie. Mix together all ingredients, stirring in chopped nut meats last. Pour into 9" pie crust. I added a layer of pecan halves on top for beauty and toasted nutty goodness. I didn't measure, just placed them in circular rows until the top was covered. Bake in hot oven (450 degrees F), ten minutes. Then reduce heat to moderate oven (350 degrees F) and continue baking until a silver knive blade inserted in center of filling comes out clean. Other recipes say to cook for 40-45 minutes at 375 or at 300 for an hour. Probably any method would work. I should have used a ring of aluminum foil to protect the rim of the crust for the last 15 minutes or so to prevent excess browning. Otherwise, it turned out well, not runny or syrupy sweet (a miracle considering the list of ingredients!). It's best served soon after baking (or microwave on high for about 15 seconds). Top warm pie with a scoop of vanilla or caramel praline ice cream and, if true decadence is desired, add whipped cream drizzled with zig-zag lines of caramel syrup. Try not to think about calories; focus on the health value of consuming good ol' Southern pecans! "Pecans are an excellent source of oleic acid, a fatty acid found in abundance in olive oil and other monounsaturated fats. These fats have a protective effect on the blood, lowering total blood cholesterol and preserving the good HDLs that help combat heart disease. In addition to improving cardiovascular health, pecans contain hytochemicals and are believed to be helpful in fighting some cancers, including colon and stomach cancers, according to Frank Sacks, associate professor of medicine at Harvard Medical School. The nuts have also been proven to be effective for diabetics, especially those placed on low-fat diets. The fiber in pecans is mostly insoluble, which has been linked to reduced cholesterol levels and shown to be helpful in warding off colon cancer. The pecans also contain an abundance of vitamins, minerals, antioxidants and fiber (see nutrient values chart). Comparing fat and calories with other nuts, pecans fall right in the middle with 189 calories per ounce. However, only 1.5 grams of the pecan's fat is saturated. Please join Susan of Between Naps on the Porch for Tablescape Thursday! I've also linked to Designs by Gollum for Foodie Friday. It's the second anniversary of Foodie Friday, and she's giving away a KitchenAid mixer! Check it out HERE. Reading your posts evoke in me a myrid of emotions. I don't know if I should jump up and down and give you a standing ovation, weep and cry for the joy overspilling my heart, sit in wide-eyed astonishment, bow in humble adoration or take a nap from excited exhaustion! You offer a week or more of information, ideas, beauty and eloquent southern quips in just one post. I will not be able to comment on everyting I love about this pot, it would be almost embarrassing! So I will comment on what I can take in for now and come back for a second and third and fourth helping of this scrumptious post! I just LOVE the magnolia chargers. I so wish I were Southern with a big old Magnolia tree off my porch. I may have to break down and buy the knock off fakes, I love them so much! They are just exqusite with your beautiful wood table and all the elegant tableware. Thank for the tutorial! I agree with you, the guest list is so important! I love my table filled with interesting conversation. It would be s facinating to have that international group of bloggers at a table together. Such accoplishment and creativity in one room! And a little comment about your pie...heaven on a plate! It is said that "we first eat with our eyes", for goodness sakes, I'm afaid I have consumed the whole thing! This is a pie I will certainly try to replicate. They also say, "immitation is the best form of flattery". Consider your self properly and truthfully flattered! What a great way to start my day! Bill, I could probable eat the entire pecan pie, it looks delish!..And as usual your Table scape is dabomb! !..I always jump(literally),when I see a new post from Affordable Accoutrements! Hangin' on every word and swoonin' on every photo. A pretty table as always -- you have such grand taste!!! And the pie!!! Wow! I always look forward to your weekly postings. That would be incredible if you got such an International family of bloggers together. I am very honoured that you have included me. Love the way you made the chargers, very creative and artistic, which is what you are!! How kind of Ken to let you know about the sale, what a great person to know!! Home made pecan pie for desert, ummmmmmmmmmm. I am off to look at the blogs of the fellow table guests from around the world. Thank you so much for such a wonderful tablescape and for including little old me!! The pie looks so good - Love a good pecan pie. Your posts are the highlight to my day. Your home is so beautiful, and everything you do creates a warm and elegant space. Even your pie was beautiful. Great blog! to read my name on one of this fantastic placecard brought tears in my eyes. I would need really new words to describe how outstanding this tablesetting is. The soft golden sprayed magnolia chargers are really a hit. The dark green leaves with the noble wood of the table to the shiny, almost pearly, Lennox china makes a tremendous contrast. Lennox is really a fascinating china. And I guess, Ken has sold this china just to you because you make such marvellous tablesettings. The tablesetting is full delight in every certain item. I didn't call with regret - I was surely (virtual) there and enjoyed it so much. I feel as if I have still the taste and the smell of your gorgeous pecan pie in my mind. So if you have time, I would love to invite you for tea. Where to start.. at the beginning. I love this table. Once again you have brought together dignity and calm. Reflection and beauty. I always leave refreshed. It would be embarrassing to mention every detail that sent me over the edge. Great find on the dishes. Lenox china is exquisite. And you showed it off to its best advantage. I wish I could get Magnolia leaves here. Mmmm. Maybe I need to plant one, how long before I have enough leaves? That is a great idea though.. The gold spray makes them so regal looking. Perfect choice of silver with the less fussy dishes. I love the centerpiece too. Great choice of guests. I like a lively conversation too. Thank you so much for your time and your effort that turned out beautiful! Plan a book, it would be the most gorgeous. Happy Wednesday, happy week and happy weekend. Another entertaining post, Bill! I enjoyed your "roll call" of international tablescapers, and you included a couple I haven't "met." It IS fun to see their tables and learn about their countries and customs. What an amazing deal on the oh-so-versatile Lenox china! 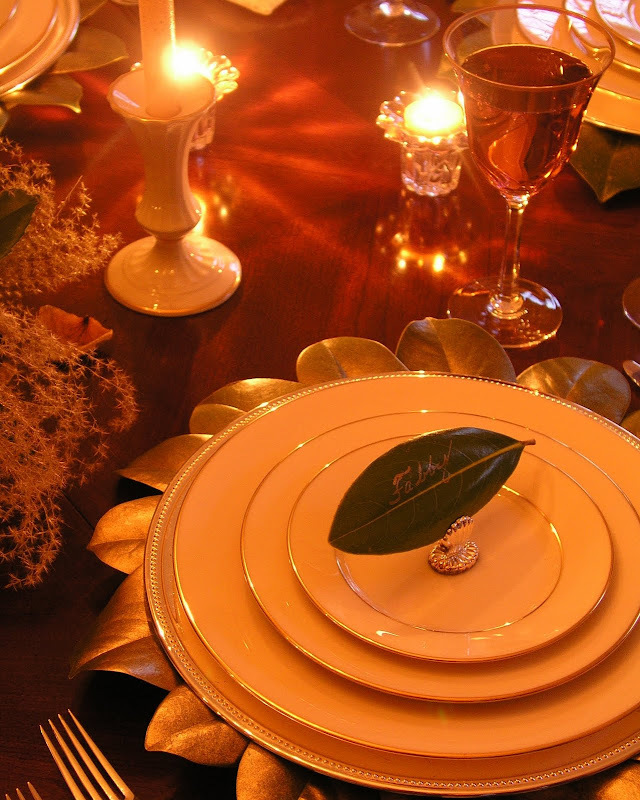 Your table looks wonderful, and the special touches of the leaves add so much interest. Another home run! Dear Bill, I have an awful admission to make - when I initially scrolled down the page and saw magnolia leaves stuck onto a paper plate I just couldn't see that it was going to work. How wrong I was! I love the finished look of each special setting..I REALLY should have trusted you. The names written at each setting are the perfect finish. I love, love love your Lennox china, congratulations on the fabulous deal. The coffee pots are a perfect foil for the rest of your amazing china. Thank you for you innovative ideas and special settings. My very best wishes as always. Oh, "Oh be still my heart" as I scrolled down and found those BEAUTIFUL Haviland Concorde teapots. They do marry up well with the Lenox china. You have have captured the epitome of design and your cast of characters sounds so interesting. Again thank you for sharing your talents to a novice, such as myself. The table is gorgeous and I even called my dh over to see how you made the chargers. We don't have magnolias, but I have something else in mind, if it ever defrosts here. The table is just gorgeous! Simply elegant. I sure hope you invited an interpreter. Or just smile and nod your head yes! Be careful though, you may be agreeing to give away all that beautiful china and crystal! And the pie, well this New Yawker would love a slice, thanks! That does it! I'm planting a magnolia tree in my yard at the first opportunity. Another incredible table. I can't even tell you how much I love your posts. Thanks for sharing them. The magnolia chargers are perfect, I was afraid they would overwhelm everything but the size complemented everything nicely!!! I'll have to compliment you on your passion for this...it must be a love for you to be so meticulous with everything...I know how time consuming all of this is and it always impresses me when I see the amount of effort that goes into creating art!!! Well- when they were handing out class you sure got a big bunch of it! This is really great...I wouldn't have imagined the leaves to be so pretty and with the added gold shimmer on them they are exceptional! How considerate of you to invite your new friends from around the world! I know "Farah" for one will be absolutely taken back! I love that china pattern, I had considered purchasing it for myself a few years back! What a lucky guy you are to have that dealer let you in on such a good purchase! Using the china with very little pattern allowed the leaves to show off even more! You did an outstanding job! I shall try your pie, my brother in law and sister are visiting in March and that's his favorite pie! Bill this is gorgeous. The magnolia chargers are absolutely brilliant. And the pecan pie, delish! Bill, you seriously need to write a book. I just adore everything you say. Your new collection of Lenox is beautiful and so elegant. I love your tricky leaf chargers! The pie looks wonderful and I am NOT a pecan pie girl, but your pie looks great! Your family must all be artists! I would love to read through your aunt's cookbook. My sister and I made a very small "family" cookbook with recipes from the ladies in the family and how they came about them. You are lucky to have your family cookbook. Thank you for such an entertaining post. Hi Bill! The magic you make is quite astounding! Everything about this post is beautiful, even the names of your guests! Great deal on the china, I got a similar pattern of Lenox from a Craigslist seller who was going through a nasty divorce. I love the magnolia chargers--I will be using that great idea this summer! All in all, your tables make me drool and I also love reading your lovely words! It would be just fantastic and I could eat some of that amazing looking pie!! Thank you my sweet and beautiful friend for adding me to your list today, yes, I'm sure we have met in a past life and thank goodness for the internet and Susan for bringing us all together. I love what you have done with the magnolia leaves as well, clever, clever you. It's fun isn't it all this fabulous styling and creating. Not sure what I would do if I didn't have a job like this. I hate to even think about it. I did a setting last night that I hoped to add today, (there is a little snap on my blog today) but I just ran out of time. I was styling a beautiful elderly lady's home in Bowral and she had such wonderful items, I just couldn't resist, and she had the most fabulous time assisting as well. She said that her children and grandchildren are not interested in her things, I said, just wait til they see them on display like this, I'm sure they will be tagged quickly. Sending lots of love, hugs and kissses from Down Under and I can't wait to visit all these fabulous guests of your above. Absolutely stunning tablescape. What a beautiful find and I love the magnolia chargers. Just exquisite!! Those dishes are gorgeous (and would go so well with some of their "Holiday" pattern at Christmas!). Your silver pattern is gorgeous too! Oh, and could you please pass a piece of pie?? Hi, Bill! I wanted to make a comment as soon as I got your post this afternoon, but I was running around like a decapitated chicken. I wanted to be able to sit down and take it all in again. You KNOW that magnolia leaf charger is the cat's pajamas! (I've got to stop saying stuff like that. My Mom says I sound older than her!) But it is fabulous! I wonder if my neighbor would miss all the leaves on her 4-year-old/5-ft. magnolia tree? :-) Maybe I should wait until it matures before I slip over there in the cover of night! I love the simplicity of the china. I agree with you...sometimes you just have to let the sheer beauty shine on its own. I have a great appreciation for sleekly designed china, stemware and flatware. Not that I don't love my design-on-steroids stuff, too! :-) OK...here's the deal: I make pecan pies all the time. We are not from the South, but we love them just the same. My son has Crohn's disease, and when he has a flare-up, that is the one thing he says he misses being able to eat the most! Anyway, I have never heard of putting cornmeal in the mix. Does that help to hold the gelatinous part together? Does it feel gritty or does it kind of dissolve? I want to try it, but I want to know what it's going to do to the pie so I don't have a mutiny on my hands! :-) I would love a solution to the pie falling apart when warmed up, and if cornmeal will do it...I'm all for it! And hey...it's OK if you're a dish addict. I'll say it loud and proud: My name is Alycia, and I'm a dish addict! Have a great week! Love the beautiful china. It really calls to me. Such elegance and class. Thanks for the reminder about the magnolia chargers. I may have to resort to stealing some leaves as I have lost my supplier of my yearly bounty. Thanks for the inspiration. After all that work... I am so sorry to hear about all of the regrets. Let's not let it go to waste... I'll be over in jiffy for some of that wonderful Southern hospitality and pecan pie! A real steal for some great Lenox. Love your chargers - adds a great elegant touch and the Haviland - my favorite!!! I will come back tomorrow for a more detailed looksy. Late here in So Cal. What wonderful creativity. You have shown that a beautiful table is possible with just a bit of imagination and elbow grease. I adore both the chargers and the name tags. The most important thing at any dinner party is the host. A host that makes their guests feel at home (albeit a much nicer home). A host that inspires lively conversations and one that brings together many different people who all feel like a valuable addition to the table. The chargers are so creative. The place settings fabulous as usual. The candlelight warm and inviting. But it is you, Bill, with each table that you set, who makes us all feel like part of your circle of friends and most welcome. My husband does go from British Columbia to his equipment supplier in Chattanooga every once in a while. You never know when I may go along and invite myself to dinner. Am I joking? Hmmmm. I usually open your posts with great anticipation, like a little girl with a box of chocolates. As I started to read lots of emotions started to creep up my mind and heart...I just looked at the whole thing with OWL eyed astonishment! The gorgeous Lenox white china, the flatware, the porcelain tea set, so perfect with the Lenox. You are a southern Gentleman at it's best, the epitome of grandness and taste! Like forever everything is perfectly stunning! The chargers you have created with the magnolia leaves show your taste and talent to it's full and thank you for sharing and the lessons on how to. Than I totally fell of my chair and couldn't stop the tears explaining to my husband that BILL invited me to his house to share his magnificent tables AND I'M THERE WITH MY NAME IN A LEAF!!! It made heart pound so hard, I thought it was going to come right out of my mouth! I'm truly so honoured you have included me in such a great group of people, I so humbly thank you in reverence and bow to ALL your tables. Thank you so very much dear Bill, keep been my friend as it's a gift in itself. It's an honor for me to be invited to your spectacular dinner. Your creativity and good taste is very inspiring. A table full of international friends, surrounded by majestic, having a great time in a beautiful and elegant tablescape, Oh!!! I am very happy to be invited. Thank you very much. Bill, sigh... Your tables are truly a delight to behold. I just love your chargers, you clever, clever man. I am finding myself picking out more and more plants for the garden for how they will enhance the table. Your photography just delights me. Please share what kind of music you like during your dinners. Last week, it was Billie Holiday here. The music is almost as important as the setting to me and I would love to hear about some of your favorites. I won't even go into that pie - what a feast for the eye! Oh Bill....how fantastic to make the chargers. Gorgeous. But your tablescapes always are. I saw a peek of those sweet silver salt and pepper too!! You are truly an amazing man! Your table is beautiful! I love so many things in your post..the chargers are very clever! Thank you for sharing your unique style. Bill, love the sprayed magnolia chargers! So pretty, I also love the china settings. Your imagination never ceases to amaze me. It's always a treat to view your gorgeous tablescapes! Bill, another lovely and inspiring tablescape! You are amazing in your creativity and energy and thoughtfulness. And, what a beautiful pie; your pastry recipe is almost identical to the one I use. I grew up amid magnolia trees (Mama insisted they be planted when they built the house). I miss having them to decorate with and regret not having planted at least one tree when we moved here. By the way, when you win the lottery and begin your travels, may I please housesit so that I can play with your dishes? My lottery dreams include a huge set of Lenox Holiday -- and room to store them! May we both win! Really pretty chargers, Bill. I hate that they won't last forever, but I wonder if the leaves will dry to a nice brown and perhaps return for a fall post. (just keep them away from the candles!) The pie is beautiful too. I like how you "arranged" the pecans in a pretty design. I am looking forward to checking out some of the faraway blogs you mentioned too. My former DIL chose that china, and I always thought it was very pretty (no, I was never invited to dine on it, but never mind). It 's very elegant and will serve you well forever. I really must try the Magnolia place mats when I get some time. We have trees all over our neighborhood. Giving them a "bath' is a good idea -- I always seem to bring in various insects when I cut some! Finally, I love your idea for a dinner party for the international bloggers. We meet the most interesting people here, don't we? What an entertaining post, Bill! Love your lacy "napkins." The china is elegant as are placecard holders. I really like your magnolia chargers, too. Great job! table. You got a great deal on your Lenox. I am a Lenox lover and have 3 and 1/2 patterns. Save yourself some work and put it in the dish washer. Bill, what a beautiful group of guests to dine at this very elegant table. I love the idea of the chargers and place cards. I've used leaves for place cards, but never have made chargers. Thanks for the inspiration. Glad the china found its way to your cupboards. It will be loved, used, and appreciated. What is not to like, your table is out of this the world. Today at an estate sale they had the exact same Lenox dishes and coffe/sugar/creamer all setting on the table. I first thought you might be in Texas taking photos. I may have to return as all goes on sale for 30% off in the morning. Returned to take a second look. Do you happen to know the pattern of the plate the pie is on? I recently purchased 10 plates at GW just because I like the pattern. Again the table is gorgeous. Beautiful. I didn't find out about this until today. I can't wait to see more. This is one of my favorite tables that you have done. So southern, so beautiful! Your tablescape is beautiful. I especially love the gorgeous Lenox china and silverwear. How creative to make the magnolia chargers. We have a magnolia tree in our front yard and we live in California. Also the pecan pie looks so delicious! Out of all the tablescapes I've viewed, this one spoke to my heart! It is beautifully elegant! We had a huge magnolia at my childhood home and my Mama was famous for her pecan pies! I was wondering where you found the fabulous ribbon used in the dried roses arrangement? Thank you so much for sharing these pictures. Have just found your blog. Love the combinations of crystal, silver, and china. What is the secret of mixing patterns to produce a beautiful table? Is there something that you look for to unify the various elements? Is it a common texture? Color? Shape? I've been trying to assemble a collection from patterns that are discontinued with others that are still in production. I was lucky that the silver pattern is still available but the crystal has been an adventure. Unvalentine's Table with Roses & Hydrangeas! Tablescape with Velvet & Lace!